The world's longest running wildlife census, the Audubon Christmas Bird Count, will begin on December 14. 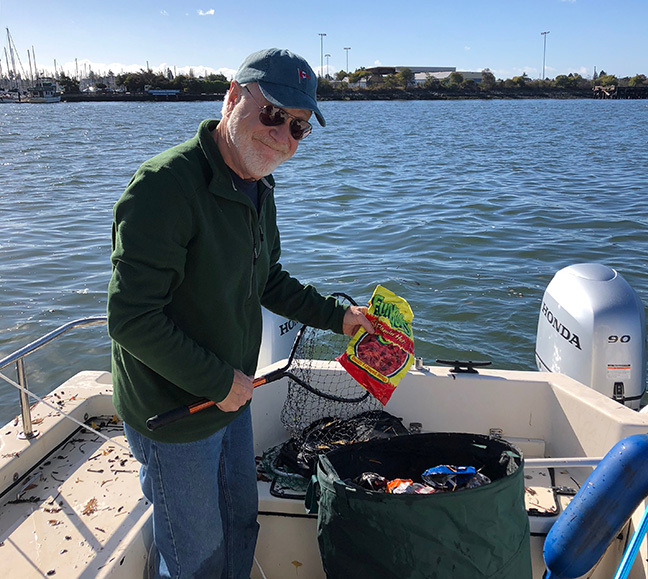 Volunteer Baykeeper Skipper Robert Fairbank will help a team tally birds in South Marin aboard the Baykeeper boat on December 29. Baykeeper's field team was busy this month with several rounds of early-morning investigations of industrial facilities around the Bay. Rainy season monitoring is the basis of our Bay-Safe Industry campaign. When we find polluters releasing toxic pollution into the Bay, we gather evidence and hold them accountable. Recent rains flushed a lot of trash into the Bay. On boat patrol after a storm in November, Field Investigator Sienna Courter found a mile-long raft of floating trash. "There was a lot of junk in the water, including plastic bags, coffee cups, and straws," says Sienna. "It shows how important it is to stop trash from getting into storm drains before it ends up in the Bay." Baykeeper recorded evidence from this incident and will continue pushing local cities to reduce trash getting into local waterways.